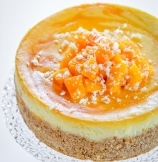 A perfectly sweet, melt-in-mouth creamy and moist mango cheesecake with a simple baking technique to bake it right, every time! 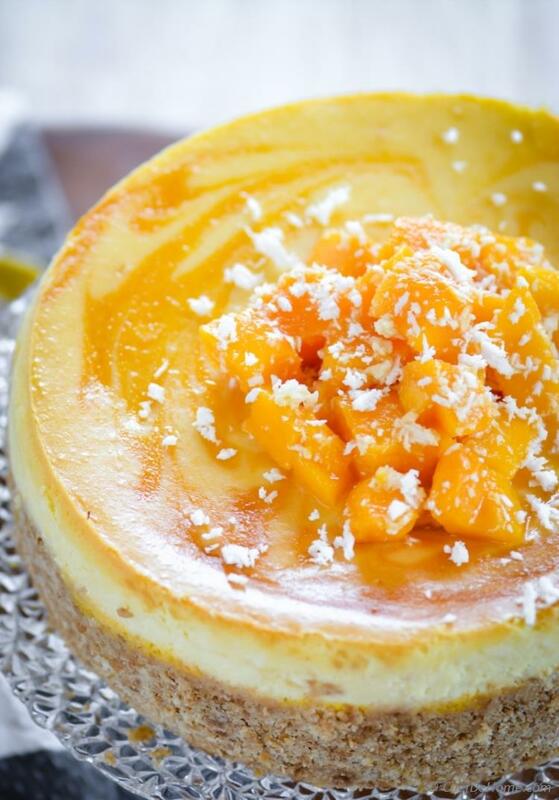 This mango season start a new mango dessert tradition, with this perfectly lite sweet, melt-in-mouth creamy and moist mango cheesecake. There is no better way to say: Mangoes, I love you and wait for you every summer season! Starting summer with a Mango Cake has become tradition of my blog. Last year was, Mango Pound Cake and a year prior Eggless Mango Cake. However, this is my first cheesecake recipe on the blog! Cheesecakes are rich creamy cakes but this one tastes very lite because tartness of mango balances the richness of cream cheese. Also, instead of just throwing the cake in oven to bake, I baked this cake in water bath which bakes cheesecake layers super moist and creamy! I don't like cheesecakes bone-clinging sweet, so this one is just pleasantly sweet. That I can tell you, for anyone who thought making cheesecake at home is too much or much much ;-) If I can bake it, so can you! I don't consider myself a big-time-baker. Even when I bake, it is mostly breads, one-layer-simple-baked-cakes and dinner roasts. I often have 100 excuses when someone ask me to bake a cake with layers or frosting... so that's reason I don't even have any cupcakes on my blog. And before we move on, the cakes you will find here are like clementine cake, almond flour cakes, marmalade cake or chocolate and chili cake.. or mango cakes!! 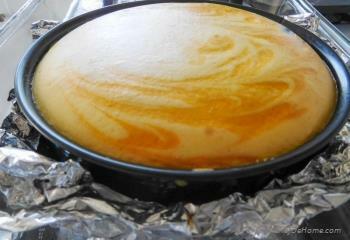 The most daunting part of this cheesecake was getting crust right and baking cake for right amount of time. I tried my best to do justice with crust and I'm sure going to practice and make it more even next time. 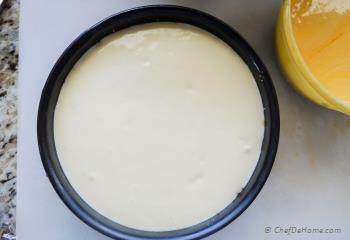 This Cheesecake is inspired from Tyler Florence's Ultimate Cheesecake (link in recipe notes). I used his idea because I loved the technique of baking cheesecake in water-bath to keep it moist and extra lite. 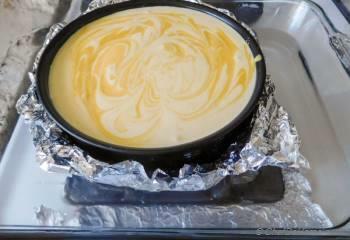 I have tweaked the recipe to make Mango Cheesecake, but method of cooking has been adapted. I would have made just his cheesecake but I was craving mangoes! Being Indian, Vishal and I grew up eating summer seasonal juicy mangoes, a lot of them. Not the kind of mangoes we get here. Yes, once in blue moon, we find a batch sweet but never as good or even close to taste of Indian mangoes. So as a substitute, when I crave for desserts with original sweet Indian mangoes flavor.... I use Kesar Mango Pulp. 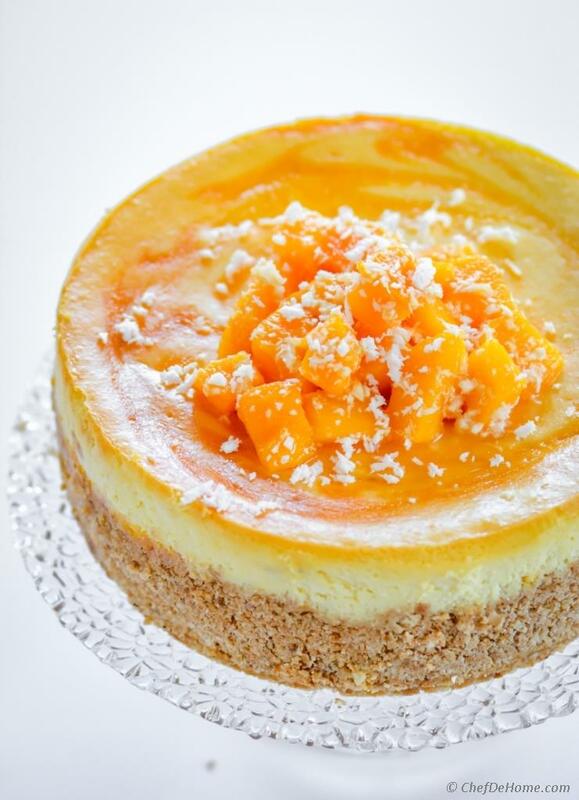 If you have an Indian store nearby or if you want this Mango Cheesecake as delicious as it looks, please get the mango puree or buy from the link I have shared. Honestly, fresh mangoes vary in taste and texture which can't result in consistent same flavored cake. Yes, you can use fresh mangoes in salads, or in some cakes where consistency can be adjusted with other ingredients... but in pure simple cheese cake, I won't take that risk. Okay, don't judge me for using mango pulp when fresh mango season is on full bloom. :) If you are really ready to put 20-30 minutes more into this cake, I can also tell you a way of making fresh mangoes work. So to use fresh mangoes, remove pulp of mango, add equal amount of water and sugar and cook'em for 15-20 minutes on low heat. Then, puree the mix and strain through fine mesh to get rid of all fiber or solids. The remaining sweet mango liquid can be used as substitute for store bought mango pulp. Now, happy? :-) I guess you are! This recipe is on the blog for two reasons: our love for mangoes in summer and Vishal's to many request to make cheese cake. As far as I can remember, poor guy is asking me to make cheese cake from almost 3 years now. No, no, I'm not that stubborn and I love love cooking for him. Whatever he wants, he gets within reasons. ;) You know what I mean?! lol! Vishal: Today, we will finish dinner with a slice of Cheesecake! Me: I don't want dessert. Let's just go home. Me: Let's go home, I will make one for you this weekend. Vishal: You said that last week too, I'm getting one! One of my favorite cake in Factory is Mango Lime Cheesecake. This one is totally inspired from it. I never thought I will make cheesecake at home, but I'm so glad I did! Fell in love cheesecake again! 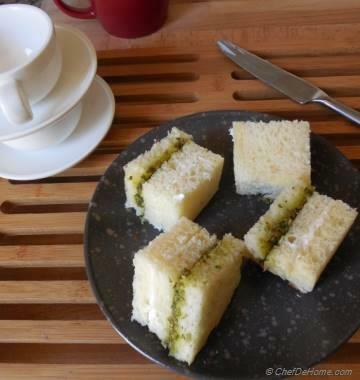 Being not over sweet, rich and fluffy, also with layers of mango flavor balancing every bites, this is one of my THE BEST homemade baked cake so far! I managed to share it just in time for holiday weekend! This cake is so good, it can fit any occasion. 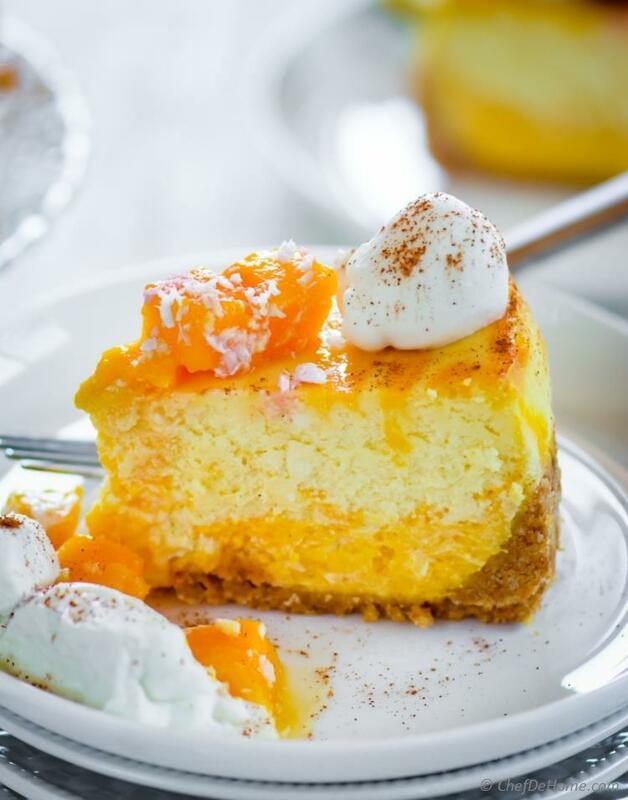 Weather it is birthday party, memorial day party or marriage celebration, this rich mango cheesecake will make you proud whenever served!! I promise! I hope you get chance to try it soon! Wish you a great long weekend! Total Time 1 hr 30 mins Prep Time 15 minutes Cook Time 1 hr 15 mins Difficulty Easy Yields 8" Mango Cheese Cake Serves 6 Notes No. of servings depends on serving size. 1. Preheat oven to 325 degrees Fahrenheit. Ready all cheese cake ingredients. 2. 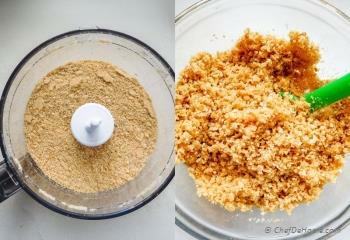 In food processor, add crackers with sugar and pulse until crackers texture is like almond meal. Add melted butter and mix well. 3. Spray cooking spray on a 8 inch spring foam pan. 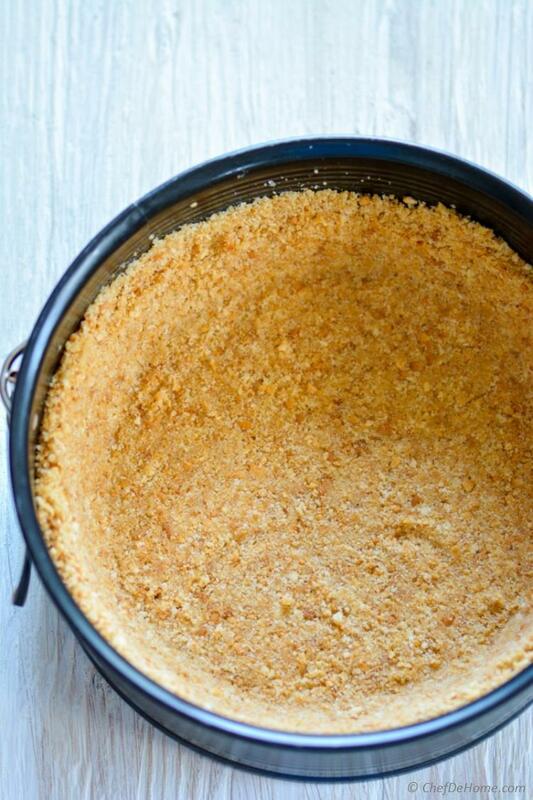 Add cracker and butter mix and press with flat bottom glass to make crust. Refrigerate until ready to use. 4. 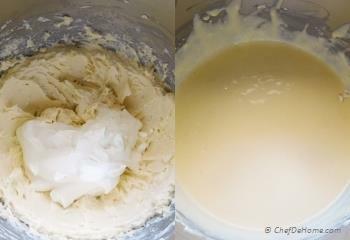 In a mixing bowl with whisk attachment, whisk softened cream cheese and sugar until it is lite and fluffy, and sugar has fully dissolved. 5. 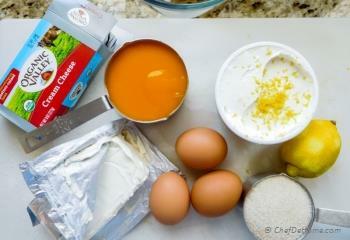 Add in sour cream, lemon zest, then one egg at a time until mixture is creamy, lite and just combined. Don't over whip. 6. 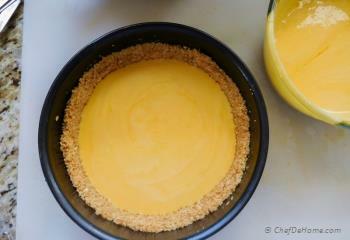 Remove half of cheese cake filling in a bowl, mix in mango puree mix with few gentle strokes. Transfer half of this mango mixture to the bottom of pan with pressed crust. 7. 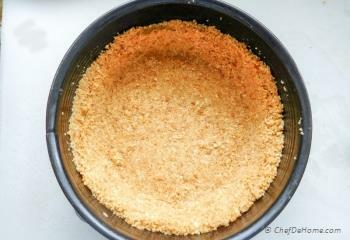 Top with all of the cheese cake mixture. 8. 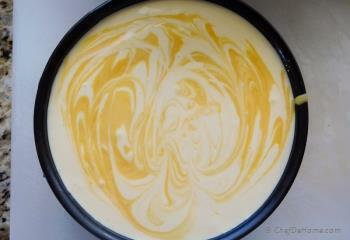 Then, top remaining mango cheese cake mixture on top and swirl gently with a knife to make pattern. 9. Place few aluminum sheets in deep rim baking pan. Place cake an on the top. Raise the edges of aluminum sheet closing tightly around the pan to cover the bottom of cake pan, so that water does not steep into cake. careful add boiling water in sheet careful not to wet the cake. 10. Bake cake in preheated oven for 65 to 75 minutes or until center just gently jiggles. If not sure, bake for 2 more minute at a time until cake gently jiggles. Remove from oven and leave in pan to cool down for 40 minutes. Cake settles down and sinks a bit when cools so don't worry. 11. 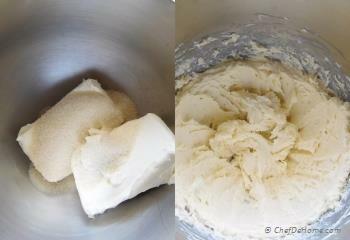 Refrigerate for at least 4-5 hours before removing the cake from spring foam pan, cutting and serving. Looks in notes for slicing instructions. If you like enjoying a slice of cheesecake with some tangy berry topping to balance the richness, this cheesecake is for you! And it is self-sufficient with layers of mango and sour cream cheesecakes a.k. no need of extra sauce or berry toppings! Slicing Tips:1. After cheesecake has been chilled for 4-5 hours, run knife through sides to loosen the cake from spring foam pan. 2. For even slices, dip knife in warm water and wipe before cutting each slice. Hi Savita, I've consistently been making cheesecakes with the same base: 12 whole graham crackers with 5 tablespoons of melted butter. I see that your base uses about double that. I want to make your cheesecake, it sounds delicious. I'm just wondering if your base is just super thick and what you think of using my standard thinner base with it? Just to clarify, each graham cracker is actually 4 small ones right? Hi Ava, first I would like to say that if you have a crust recipe that you like. Go for it. 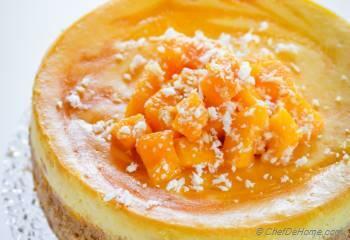 It does not affect baking of Mango Cheese Cake. That said, I use about 25 small crackers and about 5 tbsp of butter. Crust is not very thick but definitely more crisp and buttery. I hope it helps. Happy Baking. 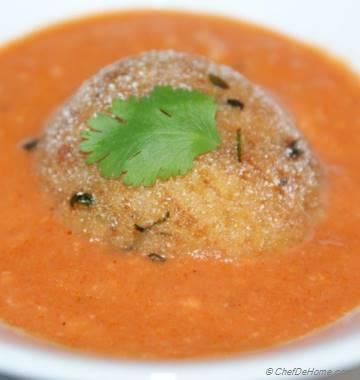 I have made this 3 times and it has been divine each time! Some have asked about the lemon zest - I put it in the mango puree. Don’t know if that’s where it was supposed to go but it works! Thanks so much for this recipe. Thanks for the feedback. I'm glad you enjoying Mango Cheesecake. Also, thanks for pointing out about lemon zest. I actually add it in whole cheese cake mixture in Step - 5. Step no.4 says to ' whisk softened butter and sugar', but the recipe calls butter only for the crust. 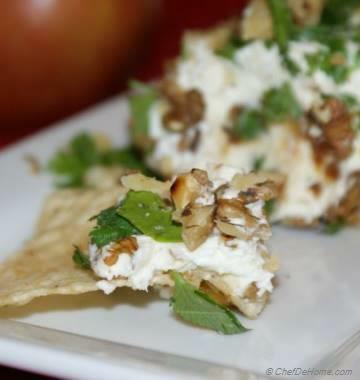 This step probably calls for the cream cheese instead of sugar in this step. Also this recipe does not say what oven temperature to bake this cake. It's nice to know the cooking time though and the size of baking pan needed. Hi Marina, thanks for pointing out. I have fixed the step to read cream cheese. it was a typo. Baking temperature is mentioned in step 1 - 325 degrees Fahrenheit. I used 7.5 inches spring pan for this cake. I hope it helps. I wish I could taste an Indian mango someday, I love mangoes but the ones we can buy here are so dissapointing, about 80% of the time. I love this cheesecake, my favorite kind of cake. thanks, Adina! If you ever get chance to visit an Indian store, they sometime carry Indian mangoes. Or look for Kesar Mango Puree. I'm sure you will enjoy it! Also, thanks for the pin my friend!